I have been planning to do this for over a year now, finally found the time. Started learning HTML5 (I recommend Pluralsight courses), and this is my first project. In version 2016, Microsoft finally introduced some drag & drop file upload for the Word/Excel template feature, but that’s it. I would like to have similar UX in entity forms and Dashboards. 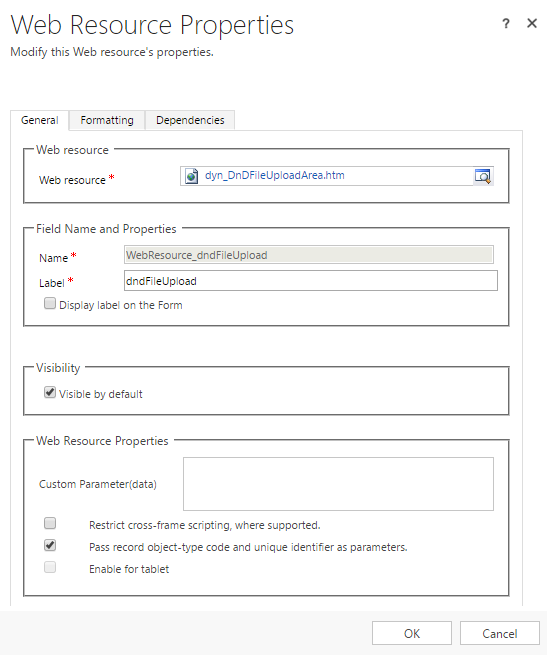 In this two-parts post, I’ll describe a working solution that allows users to upload a file by dragging it to a specific area in any business entity form or Dashboard. The solution version available in this post adds an uploaded file as an attachment to a new Note record related to the context business entity. The next post version will use a more modular approach that can be used if you manage files outside of Microsoft Dynamics CRM database. An unmanaged solution can be downloaded here. Feel free to change the code to better suit you needs. As this solution relies on HTML5 features, it will probably not work with early browsers versions. I tested it successfully with IE 11, Edge and Google Chrome v54.0.2840.71. “The solution file is invalid. The compressed file must contain the following files at its root: solution.xml, customizations.xml, and [Content_Types].xml. Customization files exported from previous versions of Microsoft Dynamics CRM are not supported. As the Codeplex platform is being decommissioned, clicking ‘download archive’ actually download the whole Codeplex project which contains among other elements, the actual solution you are missing. In order to get the solution, extract the zip file, go to the releases folder and into 0 folder. Change the only file extension to .zip and import the file into Dynamics. Just tried it, works fine. It seems that the download from codeplex is not a solution, and there seems to be missing some files for example the css file is missing. Could you please release a full version? Very cool solution if it were to work btw! This works well, but I cannot drag and drop an email file (Outlook item) or I will get a something went wrong error. I looked in the blocked extensions and msg was not in there. Any ideas? It seems that item dragged from Outlook behaves differently and this is a common problem (see https://stackoverflow.com/questions/35295522/drag-and-drop-outlook-message-into-browser/49679156#49679156). If you drag an Outlook item to your desktop first, it works as expected. I can drop txt and png files, but no docx, xlsx, pdf and msg – more other types I did not test. They are not too large, and I only get the general error message ‘something went wrong’. Do you have an idea what went wrong? meanwhile I found that it works when I choose the file via the ‘Browse’-button, but when dragging the same file it doesn’t work. Thank you for commenting, Kathrin. I would like to reproduce this, can you upload one of the files that failed to Dropbox or OneDrive? Is this compatible with the new Unified Client Interface, or web only? Just checked, the updated solution available in the following URL is compatible with UII as well as Web.